Exclusive from DfRSoft - Chi-Square Multi-Test Reliability Growth as well as the traditional Crow/AMSAA-Duane Reliability Growth (MIL STD 189) with and without test acceleration factors. Assessing your reliability growth from one test to the next can be difficult especially if you have few failures. DfRSoft now provides a simple breakthrough Chi-Square accelerated reliability growth tool for any one or more tests (RAMS Publication in 2013). Results are in simple terms of MTBF, AFR or PPM growth over test time. For example - take your results from different tests such as thermal shock, humidity, life test, or even drop tests, and now analyze your reliability growth amongst these test in a simple straight forward way and assess your product’s MTBF including Chi-square confidence and fix effectiveness. 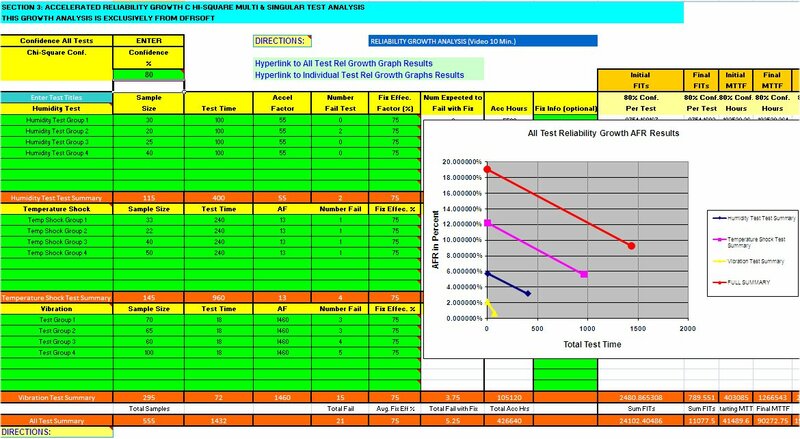 As well as this new tool, DfRSoft provides the traditional growth methods for analysis with Crow/Amsaa & Duane models for reliability growth assessment. Here as well we provide very up-to-date reliability growth published methods.